Home > Questions > Is double chin removal permanent? Will it grow back once I gain weight? 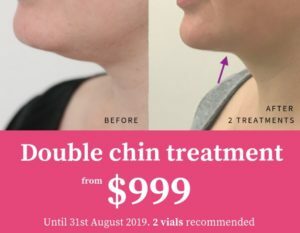 Is double chin removal permanent? Will it grow back once I gain weight? Yes, the double chin injections are permanent and will not “grow back”, if you gain weight. The ingredient in the double chin injections is called deoxycholic acid. This ingredient is found naturally in the body and it removes dietary fats in the intestine by disrupting the adipose cell (fat cell) membrane, thus causing adipose apoptosis (fat cell death). When it is injected directly into the submental (double chin) area, it destroys the fat cells in that area of the tissue. In regard to fat cells “growing back”, if you put on weight, fat cells will expand (this means the adipose cells will expand in other areas of the body), and if you lose weight, they will shrink. They are only destroyed where the product is injected. However, there have been new studies that have shown new fat cells can produce, if you gain weight.